WILLEMSTAD - Four years after the murder of Helmin Wiels we are at the end of the second phase. 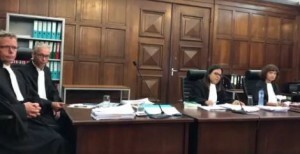 The shooter Elvis Kuwas has now been irrevocably sentenced to thirty years in prison in three instances, now it is the case against the intermediary: Burney 'Nini' Fonseca. Police and Public Prosecutor are doing everything in their power to bring the truth to light. Based on the current dossier, we believe there is sufficient evidence that Fonseca is guilty of the assassination of, the murder of, or killing of Helmin Wiels, by executing a plan with others. From various witness statements, including Kuwas himself, Fonseca's role appears to come to light. George Jamaloodin and Robbie Dos Santos are suspected of having ordered Fonseca to kill Wiels. Together with Luigi 'Pretu' Florentina, he hired Kuwas to kill Wiels. Fonseca and Florentina acted as "murder brokers" and organized the murder. Florentina kept in touch with the final perpetrators, Fonseca with the clients. Fonseca was the great man behind the scenes with a crucial role. By killing Wiels, a beloved man was taken away from his family and from the democratic process. That was also the intention of Fonseca: committing a political murder. And then not by himself, but by hiring someone else for this job. Kuwas was the gun in Fonseca's hands. With Wiels, not only Pueblo Soberano lost its leader, but also the people of Curaçao. Whoever commits the extraordinary act to kill a politician should be punished for an extremely long time. In a democracy and a rule of law, violence and bullets can never take the place of reason. Curaçao is still shocked by this murder, even because not all those responsible have been tried yet. Fonseca is silent and has always refused to give openness. Hence, he obstructs the justice to which Wiels, his family and society are entitled. Fonseca has been convicted often, even after this fact. Finally, Fonseca has never regretted or had any moral doubts when receiving the assignment, then giving the assignment and planning the tasks that led to the murder of Wiels. Therefore, the Public Prosecution demands the highest possible imprisonment that may be claimed for Fonseca in this case: 26 years. The sentence of 4 years he has recently received must be deducted according to the law. The penalty will remain 26 years. In this case, the Public Prosecutor does not demand a life-long imprisonment because this punishment is usually imposed by multiple murders or in the case of recidivism for life crimes. The investigation in the case of the intellectual authors continues. A good investigation is done carefully and takes time. In the meantime, we have requested the extradition of Jamaloodin from Venezuela, partly for involvement in the assassination of Wiels. There are still enough opportunities to gather further evidence. As long as this is the case, this investigation will not be discontinued.